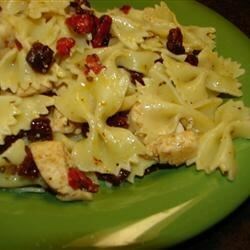 "This is an easy-to-prepare, wonderful, flavorful pasta dish that gets rave reviews! I have had many friends ask me for this recipe. After my friends prepared this dish for their friends, their friends would ask my friends for it. Goes well with a crisp, green salad and garlic bread." Heat oil in a large pot over medium-high heat. Saute chicken, garlic, salt, garlic powder, basil, and oregano in hot oil until chicken is no longer pink in the middle, 5 to 10 minutes. Add sun-dried tomatoes and cook until heated through, about 2 minutes. Remove from heat. Pour pasta into pot and toss with chicken until combined. Top with Parmesan cheese. This dish gets too dry if you drain the oil after cooking the chicken. Otherwise full of flavor and delightful.